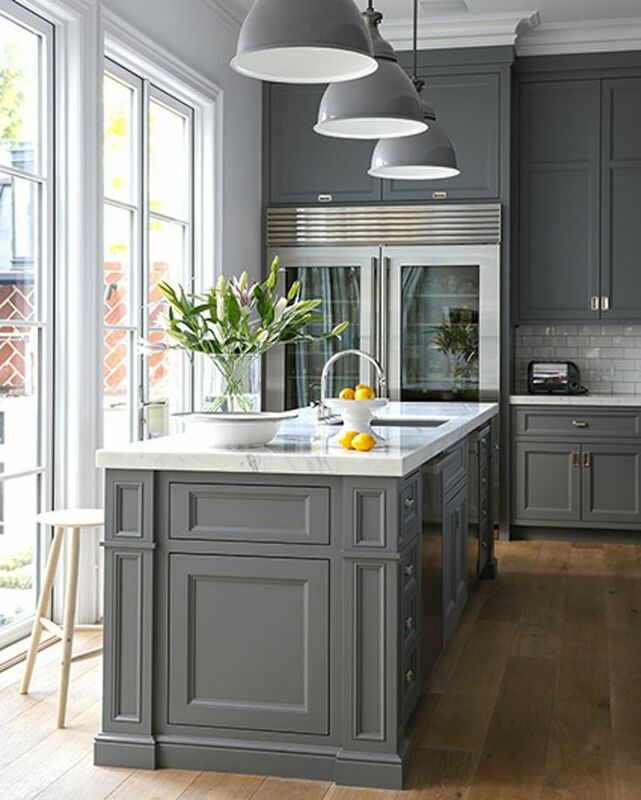 Going on its third year, grey is still one of the trendiest colors. Whether you’re looking to incorporate it on the walls, in furniture, in cabinetry, or as design accents! 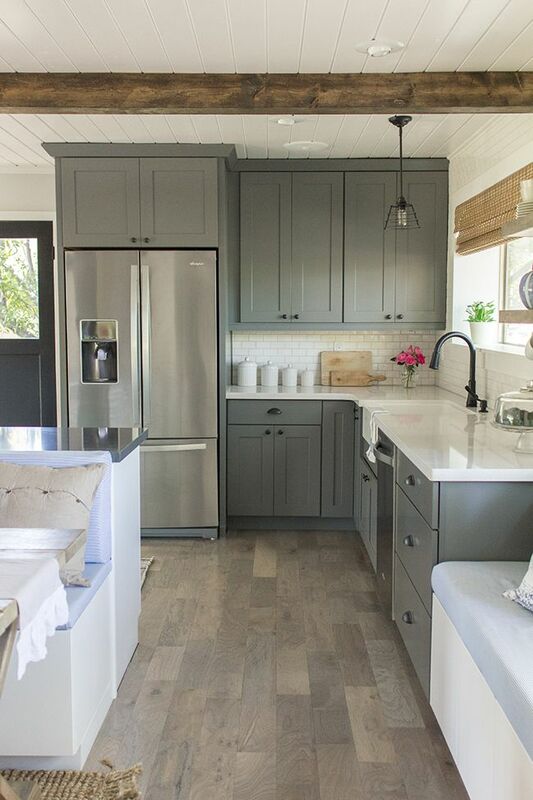 Grey is one of the easiest colors to match, which is why it is so popular! 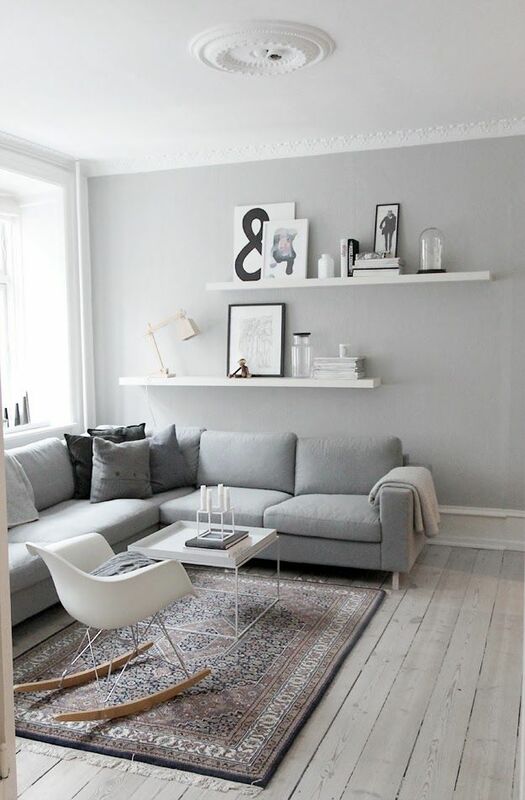 Draw some inspiration from these pictures to incorporate grey into your home! 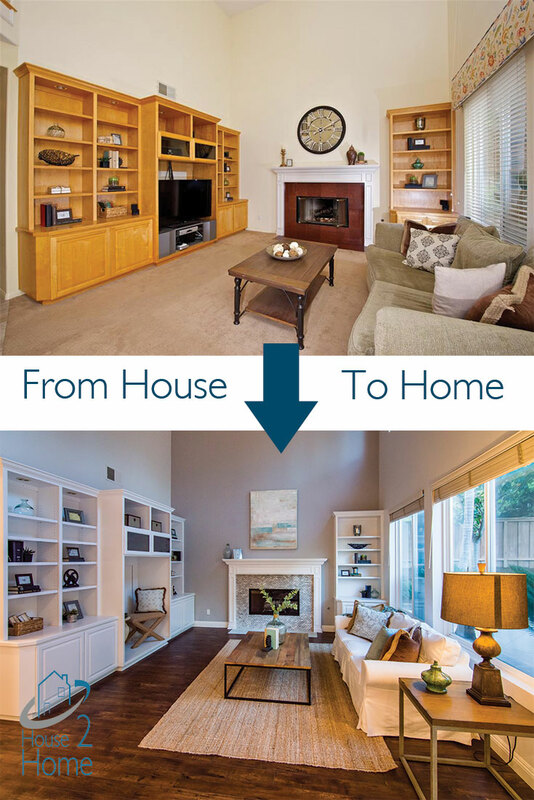 Open floorplans are super popular, and are a fantastic way to make your house feel larger! They also make your home light & bright, which everyone loves! 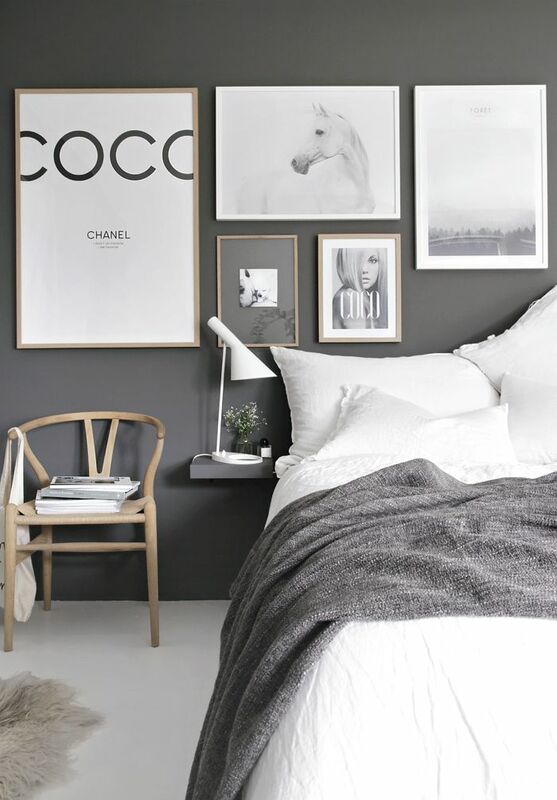 Check out these images for some inspiration! Increase speed to medium high and beat until fluffy, about 2 1/2 minutes. Scrape the bowl. 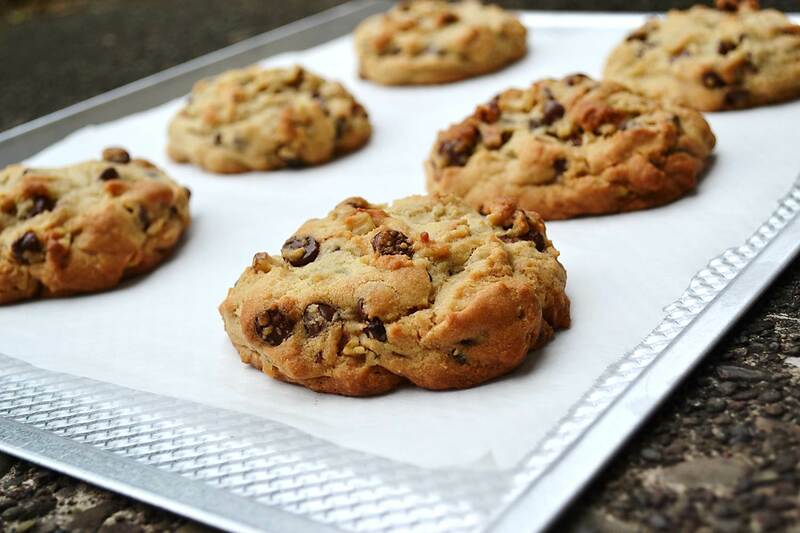 Allow cookies to cool on rack, and enjoy! Truly Exceptional! Highly sought after Davidson home situated on ½ acre plus corner lot with wonderful privacy & attention to detail. Elegant floor plan, stunning hand-scraped hickory floors, beautiful staircase with custom wainscoting, Chef’s kitchen with tumbled Carrera marble, 3 fireplaces, 10 French doors, upstairs veranda to watch hot air balloons, romantic master suite with lavish bath, 3 courtyards, & the list goes on and on. This home greets you with incredible curb appeal. SOLD for $1,549,000. 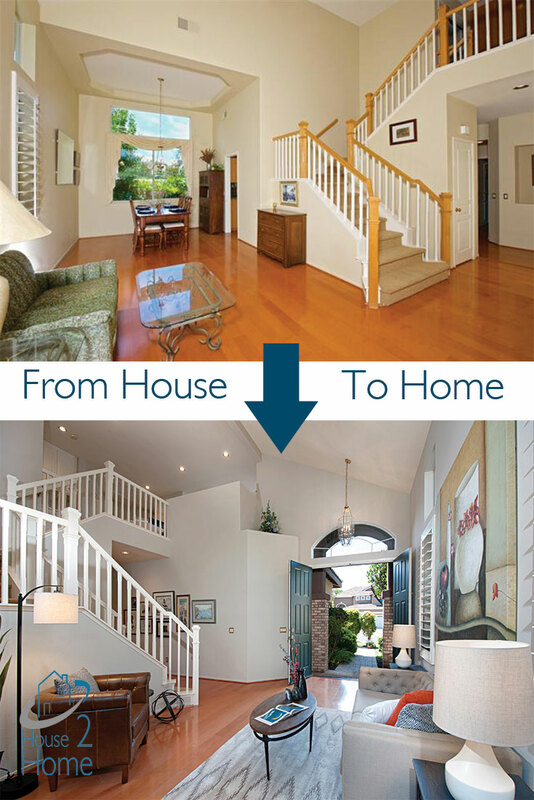 Seller will entertain offers between $1,299,000-$1,350,000~West of I-5 Del Mar Home w/peek-a-boo ocean views! Short distance to Del Mar’s beautiful beaches and the Village with plenty of shopping and entertainment. Situated on a large corner lot with mature trees, shade and lots of privacy. 4 bedrooms 3.5 baths, open floor plan with 3 fireplaces and spacious bedrooms. All of this plus a brand new roof. SOLD for $1,261,000. Stroll to shops, restaurants, and Sunday Farmers’ Market from this spacious Village home! Gorgeous upgrades are found throughout this welcoming second level Montefaro residence with its light, bright living areas and graceful architectural archways highlighted by rich, warm hardwood floors, beautiful built-in cabinetry, and wonderful lighting. Enjoy state-of-the-art community fitness facilities, pool and sun deck, barbecue and outdoor fireplace. An elegant pied-à-terre for the sophisticated buyer. SOLD for $1,148,000. Lushly landscaped courtyard is central to this gorgeous Verrazano home with glass doors from family & living rooms opening to it. Upgraded w/fine finishes & designer touches, situated on one of the largest lots w/stunning canyon views. Gourmet kitchen, all new baths, new interior/exterior paint, flooring & window treatments. Master get-away w/secluded covered balcony & dual-sided fireplace. Very private casita. All en-suite bedrooms w/artful travertine finishes. Top PUSD schools. Easy freeway access. SOLD for $1,115,000. Largest floor plan in sought-after neighborhood of Sonata. 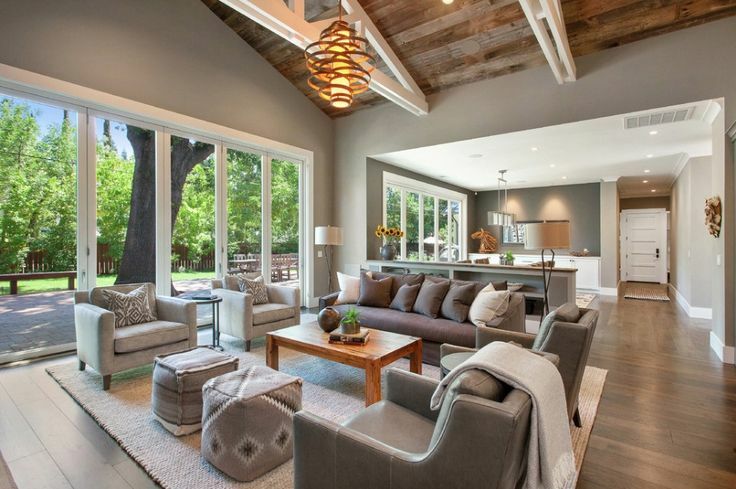 Warm & inviting with wood floors, fresh paint & high ceilings. Open concept living! Completely redone kitchen with rich cabinetry, stainless appliances & large island with seating for 6. Full bath & optional bedroom downstairs, currently being used as an office with built-ins. Large master offers completely remodeled bathroom & spacious balcony. Private, pool-sized yard with lush landscaping. Extended patio, great for entertaining! SOLD for $995,000. New hardwood flooring, designer upgrades and tasteful finishes await you in this Pienza executive home. Open floor plan with panoramic westerly views make entertaining a delight. Gourmet kitchen with custom beveled granite, expansive island and walk in pantry. Generous master with jetted soaking tub and marble detailing. Walk in closets. Very private guest room and bath. Loft includes a convenient tech area. PUSD schools, nearby shopping, parks, trails. Easy freeway access to 15, 56. SOLD for $929,000. Impeccable gorgeous dream home! Rare opportunity to own newer home with low Mello Roos in desirable 4S Ranch.Build in 2012,largest at The Pines 5BR/4BATH offers modern floor plan with 1BED/BATH d/stairs, loft & planning center.Huge south facing landscaped backyard .Located on family friendly street across park, surrounded by serene mountains, close to award winning PUSD schools,shopping,amenities.Open kitchen with huge island,granite counter, s/s appliances,beautiful cherry wood floorings! SOLD for $900,000. Gorgeous, Spanish/Mediterranean executive style home in the highly desirable Rancho Carrillo Haciendas; large lot on cul de sac in Carlsbad. Spacious 4 Bed, 4.5 Bath w/ . 23′ ceilings at Rotunda entry w/ gorgeous wrought iron staircase; gourmet sunny kitchen w/ granite, island & Kitchenaid appliances,”eat in” dining area w/ spacious family room w/fireplace; downstairs guest with full bathroom; custom built in office wall unit; upstairs oversized theater/second family room; spacious master suite & more! SOLD for $875,000. Desirable floor plan with 4 bed 3.5 bath in the famous Bressi Ranch Pirate St! Happy Halloween! Entry level bedroom with attached full bath. 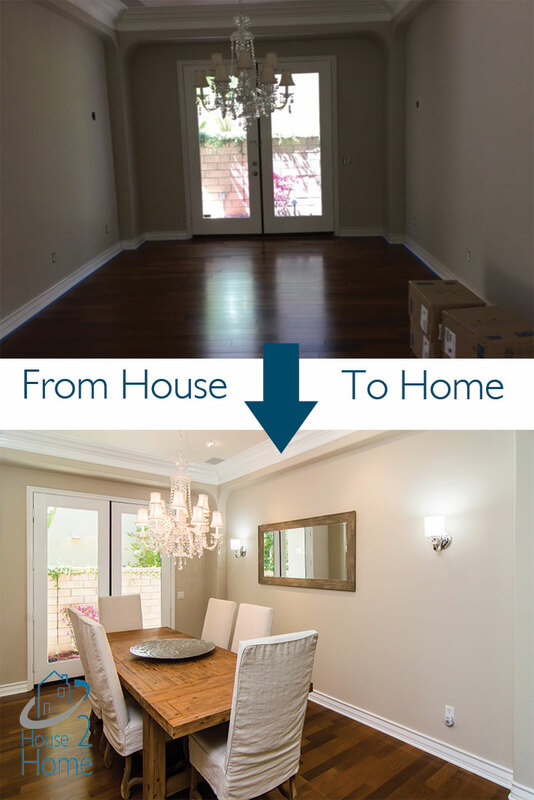 High ceilings with upgraded crown molding. Open great room with fireplace and built in entertainment center connecting to grand kitchen/island. Over sized master, laundry room, and hallway office space/ homework space, crown molding. Low maintenance private backyard with fire pit. 3 car attached tandem garage with additional storage room. SOLD for $875,000. Stunning La Costa Oaks home on a premium lot w/ no rear neighbors and mountain views. Original owner has meticulously maintained home in pristine condition! $80k in professional hardscape in both front and back of home. First floor bedroom w/ private bath! Many upgrades including wood flooring thru out 1st floor, kitchen w/ crystal green granite, Kitchen-Aid stainless steel appliances and pendant lighting, Hunter Douglas window treatments, master suite w/ marble countertops & 2 walk-in closets. SOLD for $862,000. Delightful single level in the heart of La Costa Valley. Beautiful NEW hardwood flooring throughout, upgraded baths and kitchen. Perfect size yard for intimate entertaining, easy to maintain and ideal for our current drought conditions. Close to La Costa “Valley Club” community center with pool, spa, tennis, hiking. All new ball park recreation activity center, Carlsbad Forum shops and restaurants, Local beaches and more! SOLD for $829,000. Seldom available Halcyon End Unit, 3 bedrooms, 3 full baths, with new flooring, new upscale kitchen with designer quartzite countertops. Spacious living room, family room, and entry level bedroom with full bath. High vaulted ceilings and abundance of windows for natural lighting. Large patio for entertaining friends and family. Two car attached garage with bonus storage room. Close to schools, parks, beaches, Del Mar Highlands shopping center, The 56 and The 5. SOLD for $680,000. This beautiful home offers a master bedroom and bathroom on the entry level, plus an additional 2 other bedrooms and full bathroom downstairs. The loft area upstairs is spacious and has a full bedroom with full bathroom, located upstairs, perfect for teens, guests, or someone seeking some quiet. 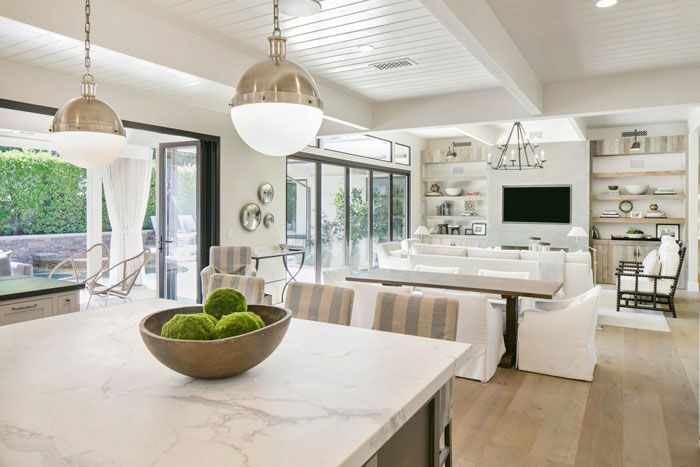 A beautiful kitchen with granite counters, looks out onto one of San Elijo’s larger rear gardens, beautifully landscaped and perfect to accommodate your family and friends. Walk to elementary and middle schools. SOLD for $677,000. Pristine Townhome in the desirable community of Crest at Del Mar! You’ll love the sunlight that fills this spectacular home in a desirable location. Beautifully upgraded kitchen in 2010~incl SS appliances, 30 bottle wine refrigerator and 5 feet of extended counter space with bar seating, plus additional cabinet storage space. Backsplash in tumbled slate natural stone and Corian countertops. Designer paint & newer upgraded carpet and tile, WH, A/C. SOLD for $658,000. This Unique townhouse is the LARGEST in the Fairway South Complex. END UNIT, situated at the end of the cul-de-sac. Includes 5 balconies and 1 porch deck to enjoy spectacular views of the 5th hole of the LEGENDS GOLF COURSE AT LA COSTA…Views from every room! Dual Masters & Studio Apt with own entry and bath. Serene & tranquil setting, yet only minutes from acclaimed beaches, schools, shops, restaurants. Come see this home to appreciate the wonderful upgraded amenities and comforts this home offers. SOLD for $625,000. Beautiful townhome in the highly sought after Ravenna development in 4S-Ranch! Decorator paint w crown molding, distressed hardwood. Upgraded Kodiak granite in kitchen w stainless steel appliances. Newer carpet in bedrooms, loft and stairs, upgraded porcelain tile flooring in kitchen & laundry room. Private end unit location w large, stamped concrete patio is perfect for outdoor entertaining. Highly rated PUSD, within walking distance to schools, shopping, & restaurants. $575,000. Beautiful Custom Upgraded Executive-Style Home in Brock Manor at Shadowridge. Recently Remodeled and Upgraded with NEW Bathrooms, NEW Kitchen & NEW Appliances, NEW Furnace & NEW AC! 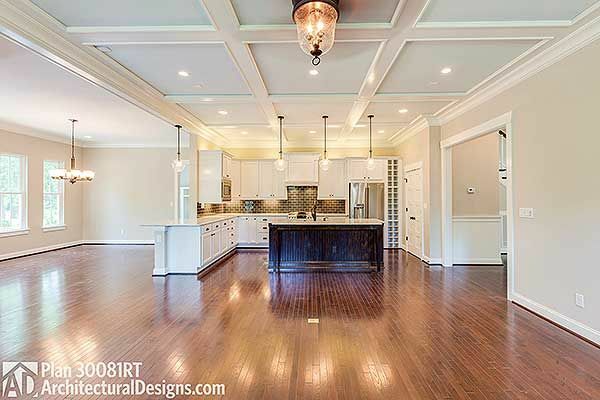 Large Open Floorplan Custom Decorated for Entertaining! 3-CAR Garage w/Epoxy Floor, NEW Water Heater, Landscaped to Perfection & Fruit Trees Too! Ocean Breezes Located High Up w/2nd Story Views of Shadowridge. SOLD for $565,888. View of city, mountains and greenery are impeccable from this gorgeous freshly remodeled 3BR/2BA house. This property boasts all natural granite floors in lower level, gourmet kitchen with granite counter-tops, Light, bright, and pleasant living. New carpet on upper level, master bathroom and 2nd bathrooms on upper are just remodeled, cabinets redone. 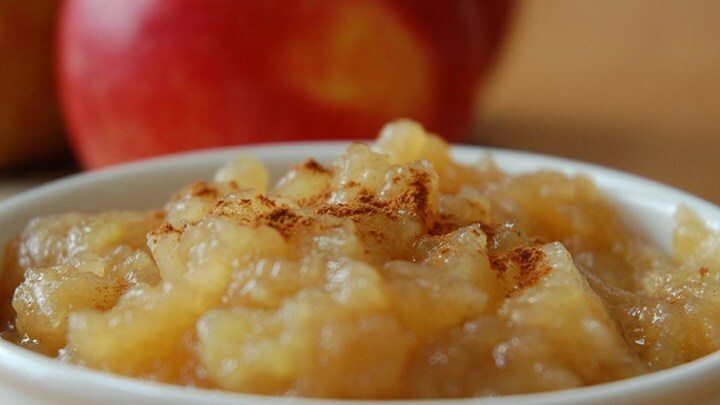 Enjoy fruit trees and a cozy patio overlooking the beautiful view. Must see to appreciate all the features of this property. SOLD for $547,500. Beautiful and spacious condo available in the heart of La Costa Village! This stunning home features a light and bright floor plan, dual master bedrooms, optional office/bedroom, and endless upgrades. New flooring, new stainless steel appliances, new granite countertops, and more! Within minutes to the Omni La Costa Resort, shopping, restaurants, and the beach! Don’t miss this stunning property! SOLD for $535,000. Now is your chance for an opportunity to own this beautiful ranch style home in Discovery Hills. Experience the open floor plan that features vaulted ceilings and an Abundance of Sunlight throughout. Perched on a quiet cul-de-sac and featuring a large and private backyard, this home is the ideal home for your kids to play. Located steps away from the AMAZING trail system which leads to beautiful Discovery Lake & Park, you are just minutes away from exploring nature and its beauty. This one won’t last. SOLD for $516,000. Don’t miss this one! Updated with newer kitchen cabinets, marble counter tops, some new appliances and ceramic tiled floors with mosaic boarders. Lots of light in this home with high, cathedral ceilings in the Great room, Dining room and Kitchen. Massive stone fireplace can be enjoyed from Kitchen, Dining and Great Rooms. Newly painted with beautiful colors and laminate flooring throughout. Enjoy 2 different decks for your outdoor entertaining and your kids will love the backyard and separated play area. SOLD for $475,000. 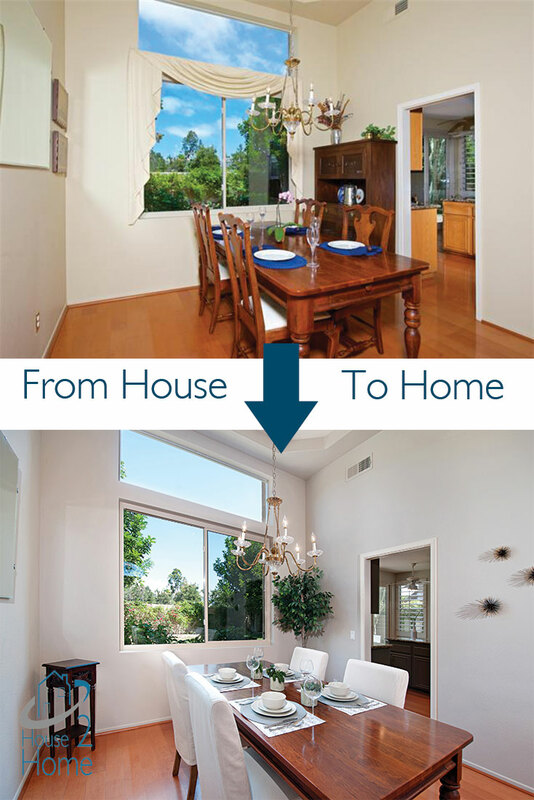 Stunning home in the highly desirable gated community of Westridge located in San Elijo Hills! This beautifully maintained 1469 sq ft , 3 bed/2.5 bath boasts granite countertops, new kitchen appliances, large walk in pantry, custom paint throughout, rich durable wood finished floors, attached 2 car garage and more! Spacious backyard patio features garden area & privacy. Laundry w/full size washer/dryer. Community pool/spa, walk to town center, top rated schools and parks! SOLD for $464,900. Wonderful home with beautiful pool & spa. No HOA fees! Brand new windows, air conditioner, heating unit and tankless water heater. You’ll be in a great convenient location, close to freeways, schools, shopping, restaurants, the base, a bike trail, a walking path and the beach. The entire home is updated with modern touches, including easy to care for concrete flooring downstairs. Great for children & pets! Fully fenced yard with additional fence creating a dog run or children’s play area away from pool! SOLD for $450,000. Wonderful Nob Hill Townhome with 180 degree views! The unit boasts vaulted ceilings, 3 decks and ocean breezes throughout the day! A new kitchen with granite, cabinets and s/s appliances, bathroom remodels, and new carpet and paint make this property stand out! Nice secure gated community with pool, a 2 car attached garage and close to everything! SOLD for $424,500. Beautiful newer complex of beautiful townhomes! This townhome has been beautifully maintained and is move in ready. Awesome floor plan that offers 3 bedrooms, each with its own private full bathroom, plus an additional powder room in the main living area. 2 car garage is attached with direct access to the home. It features a dedicated laundry room, and storage closet. This beautiful townhome is light and bright! 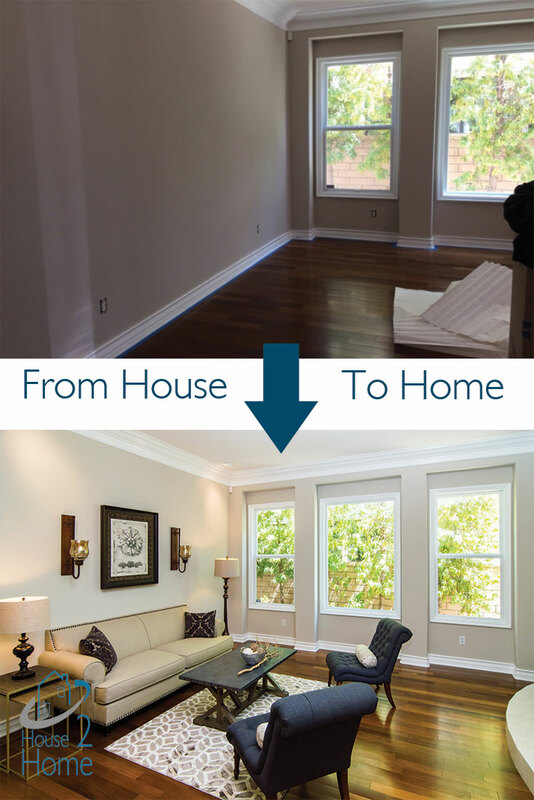 Custom Master Closet, upgraded window coverings, windows, Original owners! SOLD for $405,000. In gated Cimarron community…split level model with master bedroom on main level. This home is move-in ready! Remodeled kitchen in 2008 includes new cabinets, granite counters with custom tile back splash, recessed lighting and new appliances. Master bath was remodeled with dual vanity faux marble counters and new walk-in shower. Additional improvements: new roof (2010), new furnace, replaced all windows with dual pane energy efficient, newer garage door and rain gutters. SOLD for $383,000. Charming 2 bedroom, 2 bath in the gated complex of Palazzo Bernardo. The complex is right across from the Bernardo Heights Community Center. Enjoy Clubhouse, pool, tennis, community activities. Complex has plenty of parking for guests, is close to shopping, medical care and freeway access. SOLD for $310,000. Rarely on the market! 2br/2ba Condo in the heart of Old Poway! 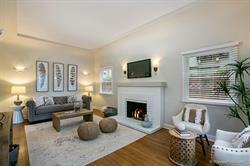 Living Room boasts tiled fireplace, private balcony & new wood laminate floors. Kitchen has stainless appliances & quartz counters. 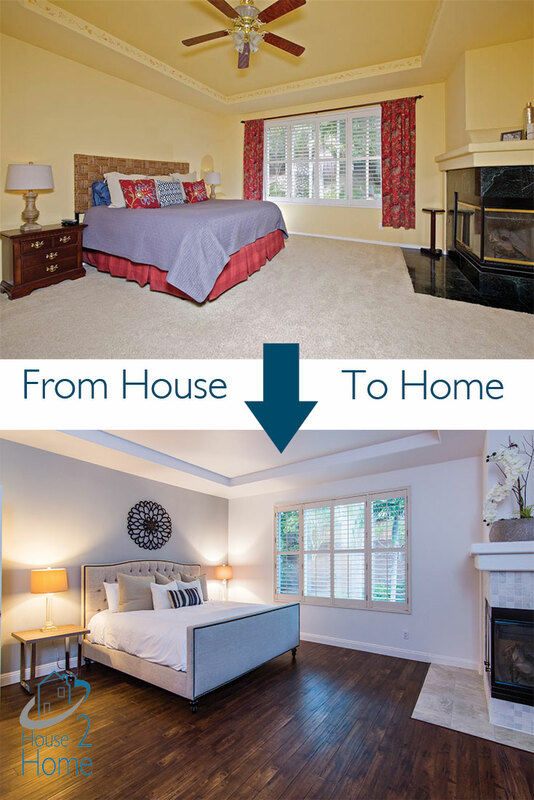 Remodeled bathrooms & freshly carpeted rooms. Master features walk in closet & 2nd private balcony. 2nd room has 2 spacious closets. Enjoy Milgard double-hung, dual-pane efficient windows, a laundry closet & 2 car det. garage. Close to all-Old Poway Park, shopping, entertainment & award winning Poway Schools! SOLD for $298,000. REMODELED home with brand new granite kitchen, white cabinets, fixtures, stove & sink. New flooring and molding throughout & complete new master bathroom. New paint & secondary bathrooms updated with new cabinets++. Large floor plan with great natural light. Corner unit with privacy, detached two car garage, large bedrooms, formal dining room & fenced patio off main living room. Common area includes a pool & green belt. SOLD for $290,000. Peaceful single level condo, offering pool, spa, and beautiful scenery. Desirable Mira Mesa complex close to shopping, schools, and 15 freeway access. Large family room with laminate floors opens to a private fenced backyard with storage room. Master bedroom features a walk-in closet. Both bedrooms have newer dual pane windows. Laundry room located inside can accomodate full size washer & dryer. Dining area off the kitchen with ceiling fan. Perfect for first time buyers or investors. SOLD for $269,000. 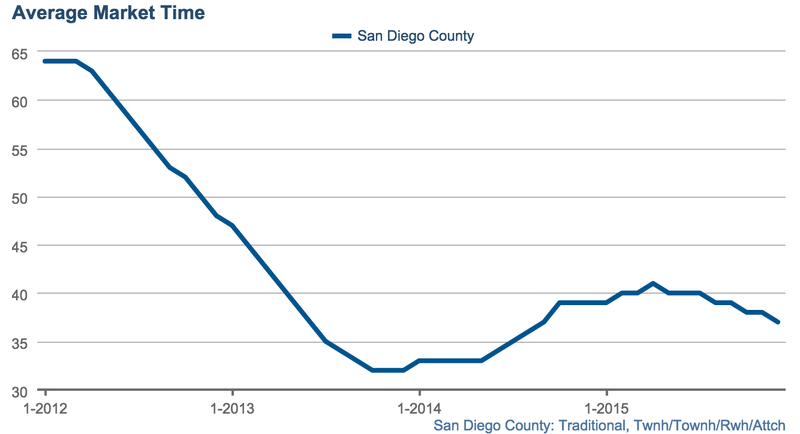 December’s real estate market in review: As of December 2015, the average detached home in San Diego county sold for $540,000, again up half a percent from the previous month. 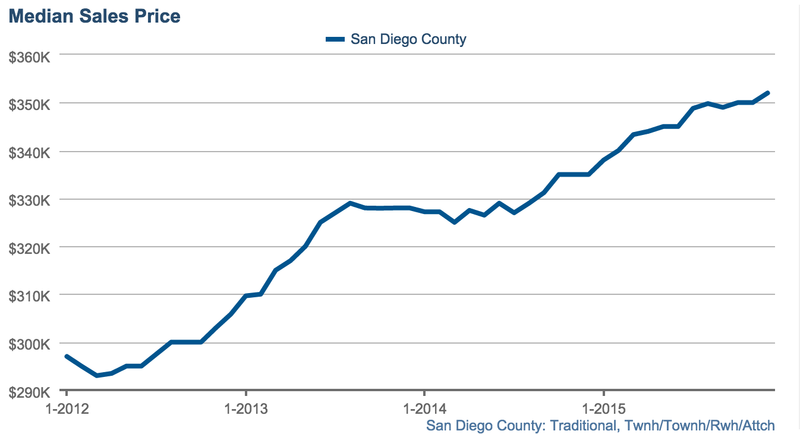 As of December 2015, the average attached home (including condos, townhomes, and twinhomes) in San Diego county sold for $352,000, up slightly from last month. 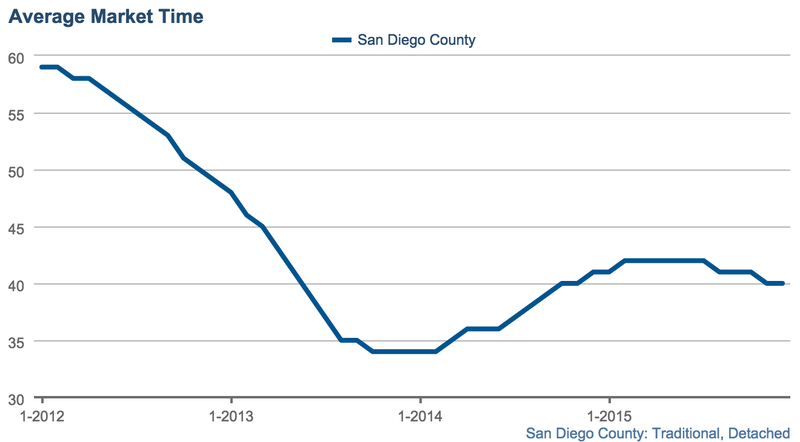 The average detached home in San Diego spent 40 days on the market. 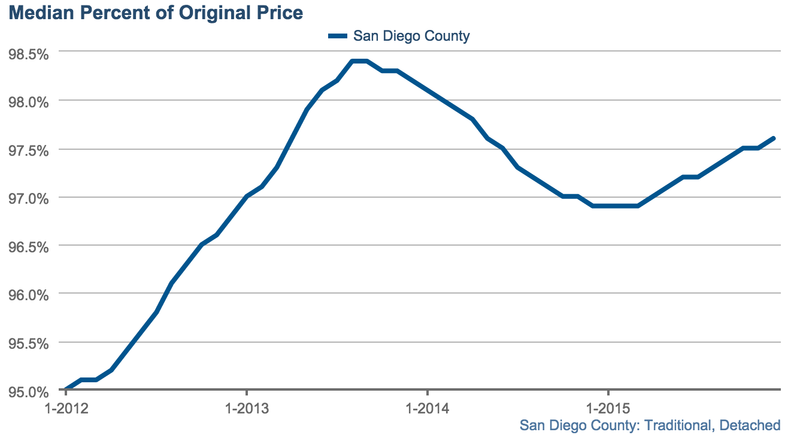 Condos, twinhomes, and townhomes in San Diego spent 37 days on the market, on average. 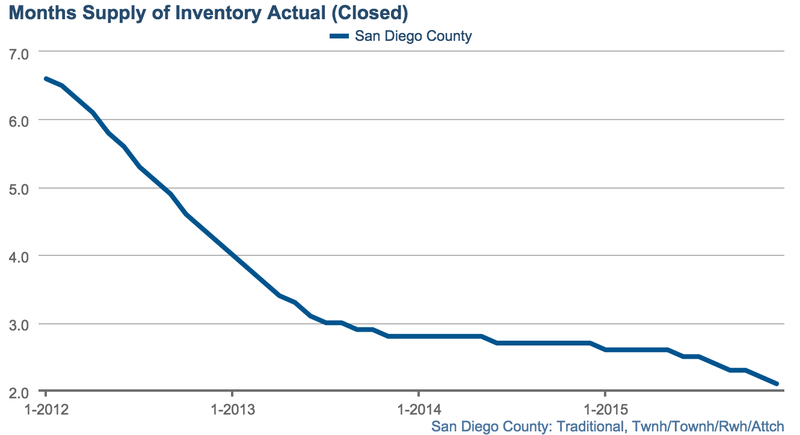 As of December 2015, we are in a seller’s market. 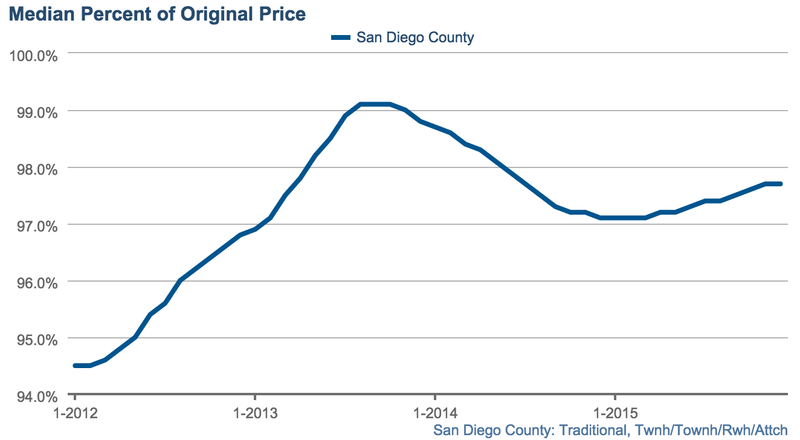 On average, a seller of a detached home in San Diego County, receives 97.6% of the original list price at the close of sale, a slight upturn from last month, but a continuation of a trend from the previous months. As of December 2015, the owners of attached properties (condos, twinhomes, and townhomes) retained 97.7% of the original listing price. 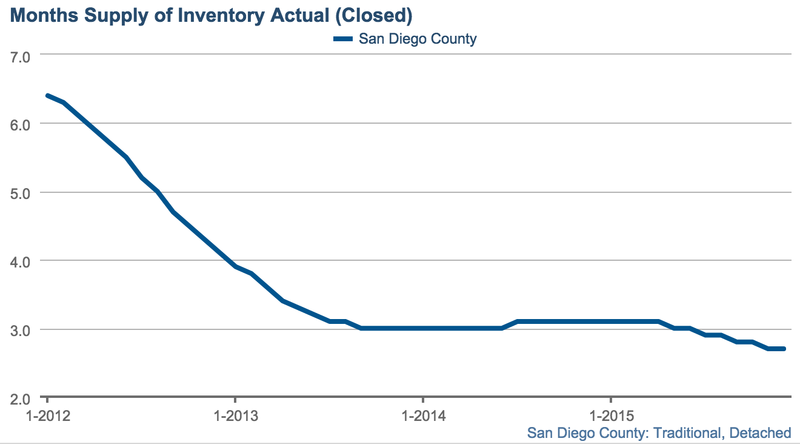 The inventory of homes in San Diego County has stayed constant. We would expect to see a rise after the winter/holidays and into the new year.